Electric Motors Market size was worth over USD 21 billion in 2016 and its demand is projected to cross 2 billion units in 2024. Global electric motors are expected to surpass 2.25 billion units till 2024. High adoption of electric vehicles will spur the industry growth till 2024. Key players in the automobile industry are continuously aiming at increasing the production of these vehicles. For instance, Volkswagen plans to accomplish 2-3 million electric car sales by 2025. These continuous efforts by the OEMs will foster the industry demand across the globe. Rising product deployment in commercial and passenger vehicles will further escalate the revenue generation over the next eight years. With the automobile industry making huge investments to cater to stringent pollution standards, the electric vehicle industry is set to grow exponentially, paving an opportunistic way for electric motors industry participants. These stringent regulations regarding curbing CO2 emissions will impact the industry growth positively. OEMs are pushed to reduce their fleet emissions that will be challenging along with ICE optimization. Achieving these targets after 2020 will require electrification, thereby strengthening the product penetration. However, operational & supply chain issues may act as challenge to the industry participants. These issues may include product delivery mismanagement or difference in expectations of manufacturer & customer regarding service quality. Probability of product failure due to overheating and low resistance is another factor negatively impacting the industry growth. Shifting consumer preference towards solar powered consumer goods has instigated immense potential to the industry size. These products have gained traction owing to provision of the benefits such as product efficiency and low power consumption. U.S. department of Energy (DOE) is making huge investments for development of superior efficiency products and promoting solar energy usage. Their rising usage has accelerated the electric motors production, thereby supporting the high revenue generation till 2024. Globalization of supply chains grew considerably in past years that has forced the industry participants to focus on supply chain management effectively. As per UNCTAD, the industry leaders aim at expanding their geographical reach, especially into emerging economies. The current & future challenge for them includes rising complexities in this supply chain networks. The factors associated with supply chain globalization include competition based on either cost & aftersales or deliver & flexibility, value chain governance typologies, and company size. Huge investments on R&D activities due to high adoption of electronic content in vehicles has strengthened the product sales. Industry players focus on products compatible with microprocessors and microcontroller used in braking, throttle and steering technologies. Shifting focus towards better stability control and superior working will further induce immense potential to the industry size. 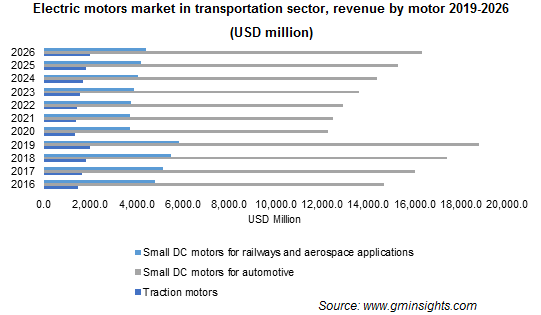 Electric motors market from small DC motors for automotive is anticipated to capture highest revenue share surpassing USD 26 billion over the next eight years owing to their high usage in automobiles over past years. Chassis and powertrain applications possess the highest applications for DC motors. The prominent mechanical applications including transmission actuation, engine cooling systems, and power steering are continuously becoming electrically driven, thus fostering the demand for these electric motors till 2024. Traction motors are poised to grow at highest CAGR of over 9% and generate the demand of approximately 11 million units. Rising production of electric vehicles will primarily stimulate the segment’s growth. Moreover, the high growth rate can be attributed to its usage as a key component in various industrial and electrical devices. Rising adoption of automation in varied mechanical operations will enhance their importance. Efficient rotational properties offering required torque in machines & engines is another factor supporting the industry growth. Small DC motors for consumer goods & industrial applications will account for over USD 7 billion and grow at over 5% CAGR over the forecast timeline owing to their high demand from appliances including ceiling fans, washing machines, and industrial machinery. Despite their compact design module, they are powerful enough to offer high performance along with high efficiency. Additionally, provision of the benefits such as outstanding control properties, durability, and low noise will further propel the product penetration over the coming years. Electric motors market from OEM accounted for over 80% of the revenue share till 2024. 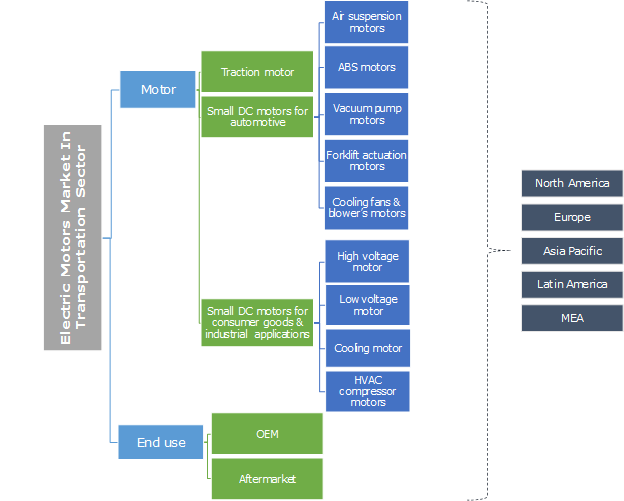 The high revenue generation can be attributed to increasing significance of DC motors in both industrial, consumer goods, and automotive applications. High performance coupled with the regular efforts of industry participants in developing cost-effective products are the major factors responsible for the rising product penetration. Rising automotive production serving the present industry trends will augment the industry demand. Shifting consumer preference towards high quality products will also support the industry dominance over the next few years. Aftermarket is set to grow at approximately 8% CAGR and will generate over 470 million units from 2017 to 2024 owing to increasing product demand from the local market due to competitively-priced products and compliance with the mandatory standards. Rising aftermarket demand from the developed regions including Europe and North America will spur the industry growth over the forecast timeframe. Asia Pacific is anticipated to dominate the electric motors market surpassing USD 20 billion over the next eight years. Rising automobile production across the region will primarily drive the industry growth. The automotive industry in the region focuses on achieving reduced environmental contaminants and better fuel economy. High adoption rate of green vehicles is credited to government initiatives taken in various countries such as providing subsidies and incentives. For instance, India’s is pushed towards electrifying vehicles by 2030 and is compelling car and auto parts manufacturers to draw early plans for electrification. Additionally, increasing hybrid vehicles sales will spur the production rate of electric motors in the region, strengthening the product penetration till 2024. North America electric motors market is poised to grow at 7.5% CAGR and generate a demand of over 378 million units over the forecast timeframe. High acceptance of electric motors in commercial and passenger cars will support the regional growth. Latin America is expected to witness a significant growth owing to increasing trading activities along to developed countries such as the U.S. and Canada. The availability of the resources such as low labour price and free trade activities in the regional growth will further support the industry demand. The Middle East and Africa is expected to witness a strong growth during the forecast time frame owing to increasing sales of ATVs. ATV is widely used for desert sports and other recreational activities. Shifting trends toward hybrid vehicles in the region will boost the overall industry demand. Exponential growth in automotive industry has resulted in substantial electric motors manufacturers across the globe over the past few years and is anticipated to continue the same over the forecast timeframe. The complex supply chain of electric motor, starting from component suppliers to its end-users has instigated immense competition within the industry. Owing to numerous suppliers, the regulatory authorities are forcing numerous standards to ensure maximum motor efficiency. Nidec Corporation, ABB, WEG, Siemens, Toshiba, and Robert Bosch are among the prominent players in the industry. Other notable players include Allied Motion Technologies, Hyosung, Regal Beloit, Shandong, General Electric, and Bulher Motor Gmbh. Industry participants believe in developing the reliability and quality of the product as well as maintaining an extensive distribution network that will lead to a strong preference for their products. Industry players are indulged in adoption of aggressive strategies such as mergers and acquisitions for strengthening their foothold. For instance, in February 2017, Nidec corporation acquired the drives, motors, and power generation business of Emerson Electric Co. to diversify its product line. Similarly, in December 2014, WEG announced the acquisition of KATT Hessen GmbH. This acquisition helped WEG to expand its R&D activities of special high-speed machines as well as strengthen its leadership in electric motors market. In July 2011, Bosch and Daimler signed agreements to establish a new company EM-motive GmbH to manufacture electric motors with a 50-50 joint venture. This joint venture distributes motors for e-vehicles and sells to third parties supported out by Bosch. According to plans, the joint venture will have manufactured over 1 million electric motors by 2020. An electric motor is an electromechanical device that helps in the conversion of electrical energy into mechanical energy. Their emergence has resulted in the elimination of manual labor and the advent of highly mechanized systems. The rising penetration of electric vehicles will primarily drive the electric motors market over the forecast time frame. The manufacturers focus on the designing and re-designing of the products for the reduction of production costs. This results in an increase in the application types for which their products and solutions can be used. They make huge investments in the development & engineering for the enhancement of their product quality. Moreover, they intend to expand into emerging markets by developing modified and innovative products based on existing engineering and developing techniques. Industry participants are involved in collaborations and partnerships for continuously upgrading the hardware products and availing them at lower prices. As electric cars are becoming common, the OEMs need to find better ways of availing the raw materials. Pricing of the product is highly dependent on the power offering and the mileage offered by the product per charging. Major factors affecting the pricing of the electric motors are the steel pricing. Electrical steel sheet is utilized in the core of the traction motors of hybrid electric vehicles. fluctuating demand of steel from various industries affect the price trends of the product. Partnerships facilitate better distribution of efficient systems and recognizes advantages of working within the existing marketplace. For instance, Tecno S.r.l.is the partner of OME Srl that enables finding solutions that will allow end user to save energy with advanced technology.